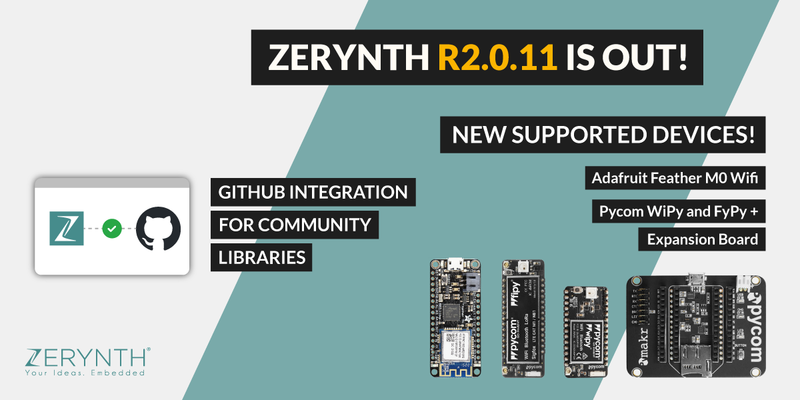 we are proud to announce that Zerynth r2.0.11 is out with new supported hardware and a very cool feature. Here’s a summary of what’s new. Refer to this thread on the community forum for more info. Pycom WiPy 3.0 and FiPy 1.0, two low-power development boards based on ESP32 by Espressif Systems are now programmable in Python using Zerynth. Unlike the other Adafruit boards supported by Zerynth (Adafruit Feather Huzzah and Huzzah32, which are based respectively on ESP8266 and ESP32), this powerful board is based on an ARM microcontroller by Microchip Technology and features the ATWINC1500 Wi-Fi module, a low power network controller. Based on feedback from many of you we decided it was time to allow you to share your code directly from GitHub and to contribute to the Zerynth Community with your libraries. Zerynth Studio now allows publishing your projects as community libraries that can be installed by everyone else in the Zerynth community. Worldsemi WS2812 RGB LEDs (or NeoPixel in Adafruit parlance) now work with ESP32 and ESP8266! Try this simple code on a Pycom WiPy or FiPy and enjoy!